Surprise: Democratic candidates aren't talking much about Trump. Here's why. The fewest campaign attack ads focusing on an incumbent president at this stage of the midterms in more than 15 years. WASHINGTON — It feels like President Donald Trump is everywhere in the final stretch of the midterm election: At rallies, on social media, on TV shows. Everywhere, it seems, except in Democratic campaign ads and political messaging, where dislike of the president is being downplayed in favor of a closing argument focused on health care, taxes and protecting entitlements. A report by the Wesleyan Media Project, which tracks political advertising, found that Trump came up in just 10 percent of ads from Sept. 18 to Oct. 15 — and only 5.5 percent of them were negative. That's by far the lowest proportion of attack ads against a sitting president since the 2002 midterms, when George W. Bush's soaring popularity after 9/11 made him off-limits for Democrats. The trend is all the more striking given Trump's relative unpopularity. His approval ratings have sagged in the 30s and 40s since his early days in office, and he's generated an intense backlash of progressive activism, fundraising and candidate recruitment. "(The) extent to which Trump is absent is surprising," Patrick Ruffini, a Republican pollster at Echelon Strategies, said. Interviews with Democratic officials, allied groups and volunteers on the ground point to an array of overlapping causes that help explain the party's lack of focus on hostility to Trump as a way to drive voters to the polls. First, Democratic operatives assume that attitudes toward Trump — while critical to the midterms — are already "baked in" thanks to his omnipresence in the political conversation. With the president constantly setting news cycles on fire, there's more value in promoting topics that might otherwise fall out of the conversation. "Nobody will cover or talk about health care unless we pay for it," Nick Gourevitch, a Democratic pollster at Global Strategy Group, told NBC News. "And directly because of Democrats advertising on health care, we are now seeing Republicans — and the president — respond and engage on the issue, which is a debate Democrats welcome because voters trust us more on the issue." In the latest period covered by the Wesleyan Media Project, almost no ads mentioned Russia or Robert Mueller's investigation even as stories on these topics have dominated cable news and front pages at major papers. Democrats worry that training their fire on Trump when he makes false or offensive claims, while sometimes necessary, could also distract from messages that address voter concerns more directly. "From what I have seen, most Democratic candidates are doing this right," Dan Pfeiffer, a former aide to President Barack Obama and co-host of Pod Save America, told NBC News. "Trump wants everyone to follow him down the rabbit hole, because every moment we spend yelling about the latest Twitter outrage is a moment not spent on the messages that we know work with the voters that will decide the election." Part of this shift is a reaction to the 2016 election. There's a widespread belief among Democrats that the party erred in running ads about Trump's offensive rhetoric rather than puncturing his populist appeal on economic issues. Another big factor in the lack of Trump-centric messaging is the midterm map, which includes an unusually high number of races in deep-red territory. Democratic Senators in Indiana, North Dakota, West Virginia and Montana have even run re-election ads showcasing their support for Trump policies like building a border wall. On the House side, Trump's role in campaigns varies significantly from race to race. In suburban seats where the president is especially unpopular, ads targeting Republicans like Mike Coffman in Colorado's 6th District, Barbara Comstock in Virginia's 10th District and Brian Fitzpatrick in Pennsylvania's 1st District all tie the incumbent’s voting record to Trump. Trump also pops up in ads in California and Florida races that include a high concentration of Hispanic voters. But Democratic targets this year also include dozens of incumbents and open seats in more rural districts that Trump won in 2016. In many races, Democratic candidates are emphasizing their independence from partisan politics and are trying to peel off voters who might otherwise support the president. It's not just persuadable Trump voters that Democrats are worried about alienating, though. Progressive groups working on voter turnout at the grassroots level say that leading with anti-Trump information for voters is sometimes counterproductive with key liberal-leaning demographic groups, including millennials and Latinos. Some activists fear that the noise around the president might discourage those who may not be likely to vote from participating in politics rather than psyche them up to cast ballots. Officials with For Our Future, the get out the vote group backed by Democratic donor Tom Steyer and a coalition of labor groups, said at a briefing with reporters last week that their research found anti-Trump appeals varied significantly in effectiveness depending on the region. Voters in well-off suburbs might name Trump as a top concern, but in more diverse and urban areas he was often far down down the list behind issues like health care, education or gun violence, some of them highly specific to the state or city. "Trump is always going to animate the electorate, there's no way to get away from him," said Justin Myers, CEO of For Our Future. "I think it's important that we have something to give folks to vote for." At a meeting of College Democrats at the University of Florida last week, several students complained that they felt overwhelmed by the media's focus on the president. They said they encouraged their members to focus on policy issues, state and local races, and grassroots organizing rather than venting about the White House. "We're reacting to Trump in a sense, but that's more us helping the people he's harming, not necessarily following every little thing he does or every corrupt thing that happens with him," said John Etienne, 19, political director for the university's College Democrats. "I want Trump to be removed from the equation," Maia Crook, the group's vice president added. In other activist circles, opposition to Trump plays a more central role. Leah Greenberg, co-executive director of the group Indivisible, said a key source of energy among their volunteers was a sense that the president was eroding democratic institutions. One of their top priorities in the midterms is convincing voters that these concerns should apply to the broader GOP. "While fear and alarm about Trump are core motivators, at the same time he's not something that's so very different from your regular Republican who represents you in your district," Greenberg said. While Democrats are upbeat about their chances, there are some worries on the left that they may have overlearned the lessons of 2016 and internalized the idea that Trump is immune to personal scandal. The New York Times published an investigation this month claiming the Trump family may have avoided paying hundreds of millions of dollars in taxes, and the story has barely factored into the election. 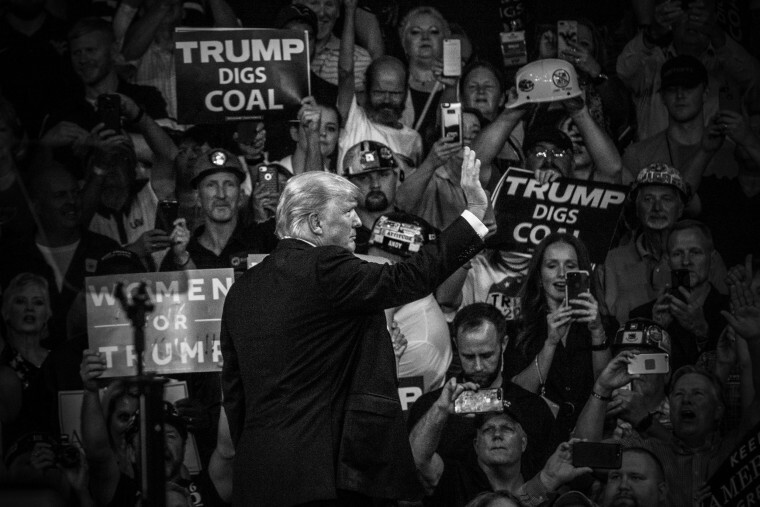 While corruption is a frequent topic of Democratic ads, they tend not to refer to specific allegations surrounding Trump, instead drawing a broader connection between Republican policies and wealthy donors. "It feels like we tricked ourselves into believing Trump is unbeatable and invincible," said Sean McElwee, a progressive activist and founder of Data for Progress. CORRECTION (Oct. 26, 2018, 11:10 ET): A previous version of this article misstated when the Wesleyan Media Project conducted its campaign ad study. It was Sept. 18 to Oct. 15, not Sept. 15 to Oct. 15.